CONTEST! Dog Tags for Christmas Pre-Party!! with Lindsay McKenna! CONTEST #2 starts right now: 9.12 – 9.18.2016! with Lindsay McKenna! 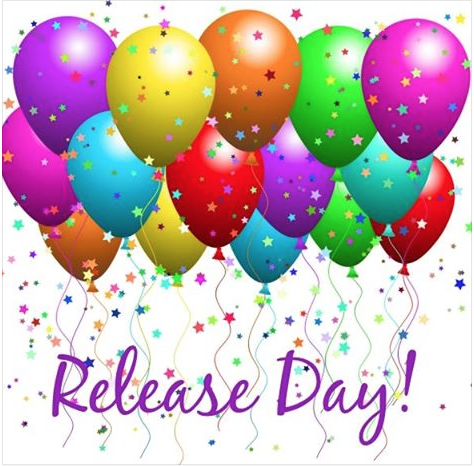 The countdown is on for our FB party 10.4.16 (9am to 9pm EDT) and in the meantime, the surPRIZES will start NOW!! 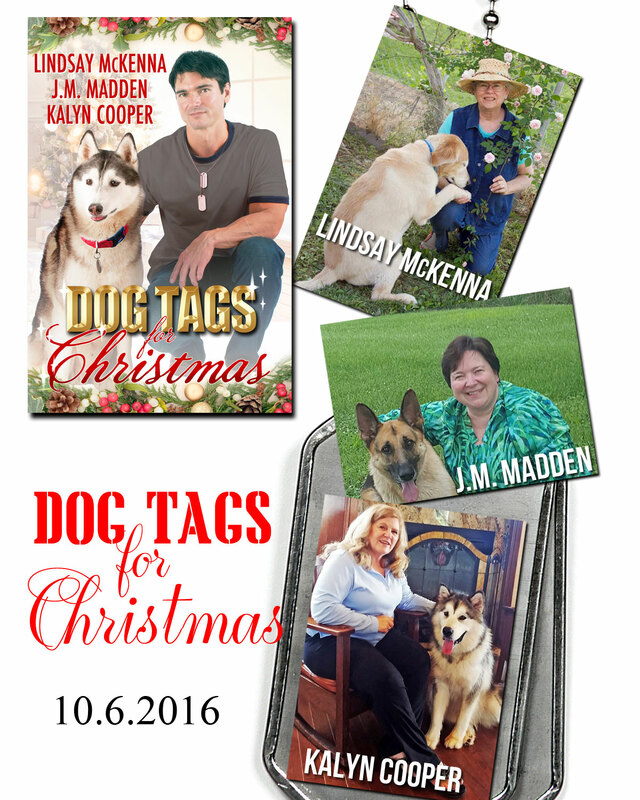 Pre-Order NOW and Dog Tags for Christmas will arrive October 6th! 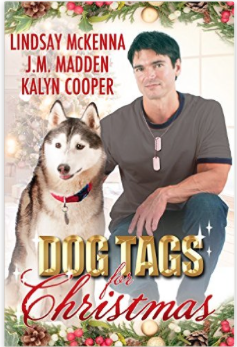 Dog Tags for Christmas is all about Vets and Pets. Tell me about the very first dog that entered your life. His/her name, breed (if any) and how that dog played a part in your young life. If you don’t have a pet, show us a picture of one that you wished you’d had as a young child and why. Winner will be chosen by random on Sept. 18th when a new contest will be announced. It will be announced on this party page, so be sure to come back and look to see if you won!! Facebook has nothing to do with this contest. No purchase necessary. It is a story that features two dogs owned by the hero and heroine and they almost steal the show ;-))). 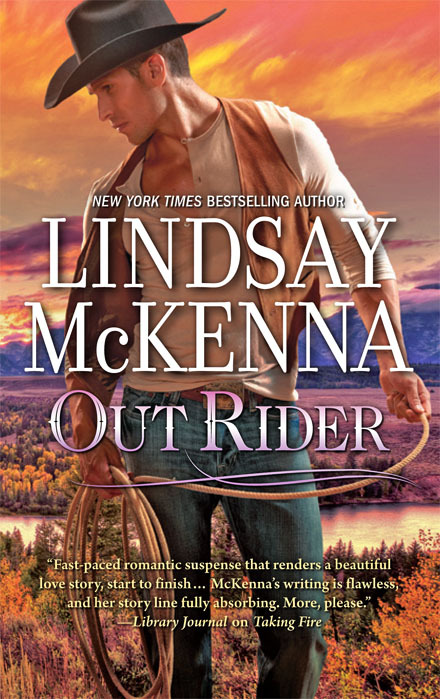 WIN an autographed copy of OUT RIDER by Lindsay McKenna! To get you started, let me tell you about my first memories of the first dog in my life. His name was Blackie, and he was a black and white border collie. I was five years old at the time. I had two other siblings, age 4 and 1 year old at that time. I remember Blackie because we lived on an island in the Snake River near Ontario, Oregon. My parents were paid to take care of a sheep herd that lived on that island; hence Blackie was there when we arrived. His job was to take care of the herd of sheep, and keep them safe. The only way back and forth on that island was a long railroad trestle bridge across the river. Blackie “herded” me around, even though I wasn’t a sheep, always at my side, never far from me or my siblings. It was only later that I found out that Border Collies herded sheep was instinctual. He was a very loving dog and my best friend. And he’ll always have a place in my heart and memory. Unfortunately, I have no photos of him. 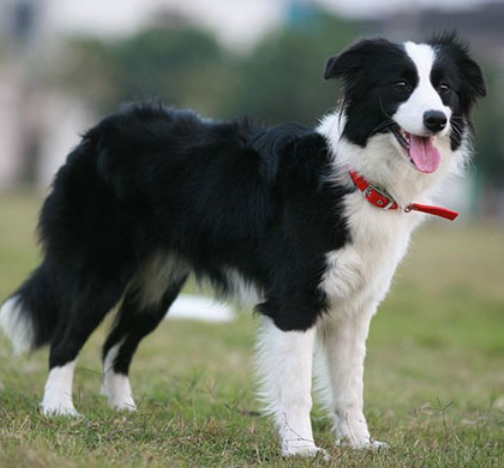 But here is one I grabbed off the internet, in case you don’t know what Border Collies look like ;-). Blackie was the first dog in my life and I was 5 years old at the time. Now! Share your story of the first dog that came into your life over on our FB party page! 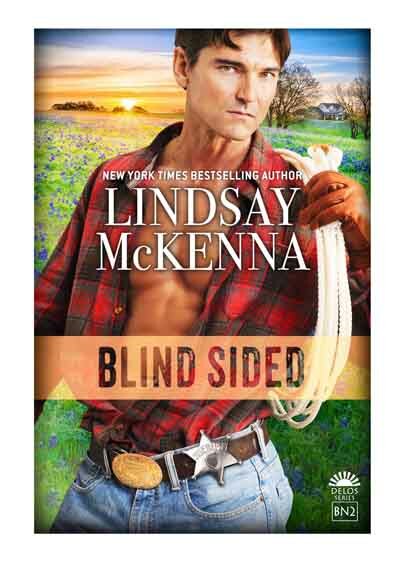 EXCERPT #2 BLIND SIDED by Lindsay McKenna! 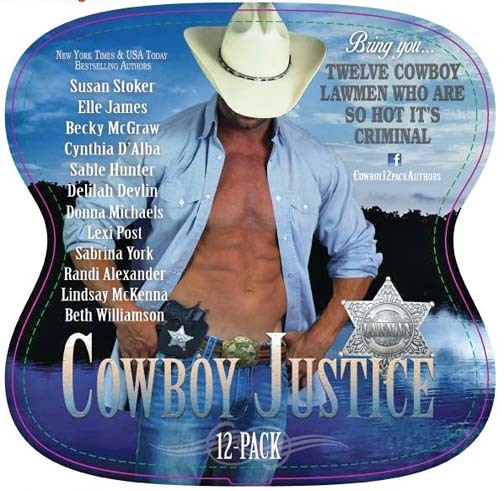 GET YOUR COPY of COWBOY JUSTICE and read 12 great novellas, including BLIND SIDED! A special blog stop today for SAVED BY A SEAL! Please drop by. There is a $15.00 give away to the lucky winner–so sign up! Every purchase of SAVED BY A SEAL proceeds to directly to americasvetdogs.org to help in the purchase of a service dog for a wounded military vet. Please think about being a part Chris Keniston, Susan Stoker and Lindsay McKenna’s efforts to “get the word out” on this deserving charity. Every purchase of SAVED BY A SEAL proceeds to directly to americasvetdogs.org to help in the purchase of a service dog for a wounded military vet. Please think about being a part Chris Keniston, Susan Stoker and Lindsay McKenna’s efforts to “get the word out” on this deserving charity. Please SHARE. Thank you! TO SIGN UP FOR A CHANCE TO WIN A $15.00 GIVE-AWAY, GO HERE to: Lost in a Story Blog! 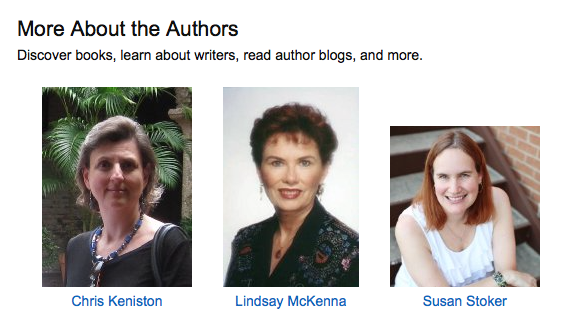 These three authors want to raise as much money as possible for this charity! Please be a part of it! 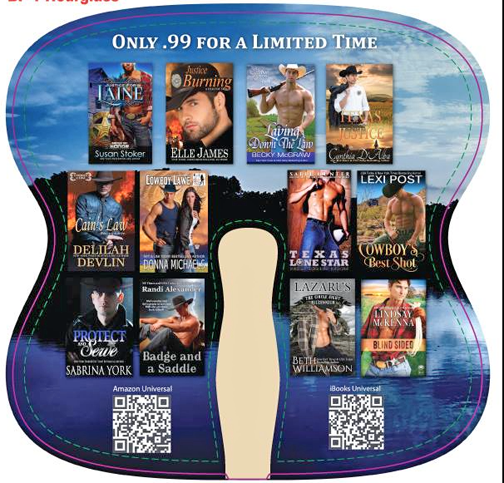 ALL proceeds go toward the purchase of a service dog for a serving wounded military vet! 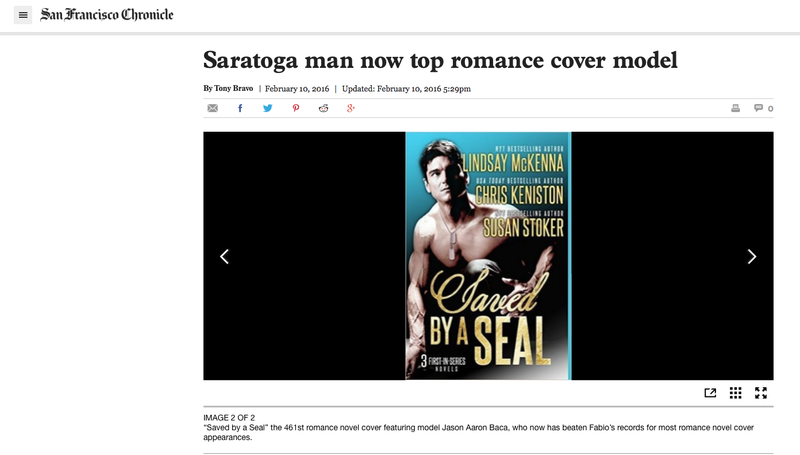 ROMANCE COVER MODEL JASON AARON BACA BREAKS FABIO’S RECORD of 460 COVERS with #461, SAVED BY A SEAL by Lindsay McKenna, Chris Keniston and Susan Stoker!! ROMANCE COVER MODEL JASON AARON BACA BREAKS FABIO’S RECORD of 460 COVERS! Jason Aaron Baca poses for the San Francisco Chronicle after breaking Fabio’s cover model record of 460. He has just surpassed Fabio with his 461st book cover: Saved by a SEAL by Lindsay McKenna, Chris Keniston and Susan Stoker! Congratulations, Jason! 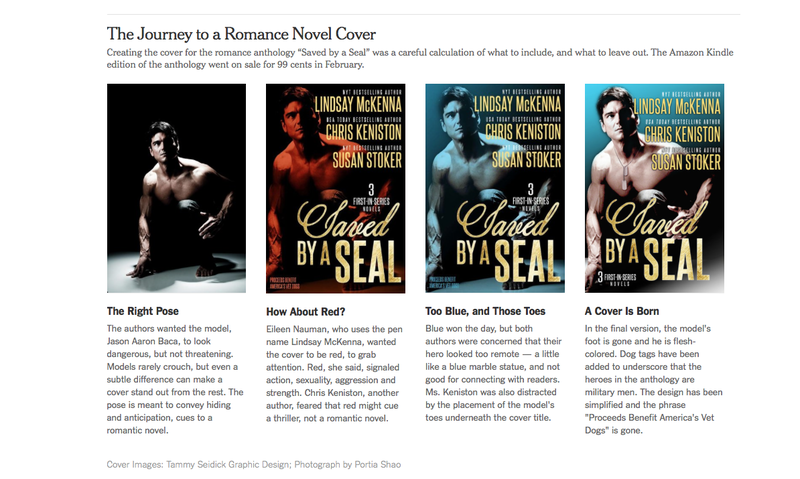 Saved by a SEAL by Lindsay McKenna, Chris Keniston and Susan Stoker is his 461st cover!!! The San Francisco Chronicle celebrates Jason’s incredible record of 461 romance covers! Lindsay McKenna, Chris Keniston, and Susan Stoker want to celebrate Jason Aaron Baca’s momentous accomplishment by breaking Fabio’s cover record! We couldn’t be prouder of him (he’s a very nice guy). We want you to know that as authors of SAVED BY A SEAL, which is Jason’s 461st cover (the book that broke Fabio’s record of 460 book covers) that you might be interested in the ‘story behind the story’ about this book. The three of us want to give back to our military men and women who are suffering from PTSD. We chose http://www.vetdogs.org, a 501 non-profit charity who trains service dogs for our vets who need support. ALL the money from SAVED BY A SEAL goes directly to this charity and NOT to us. We want to thank the San Francisco Chronicle for being a part in this wonderful, heartfelt mission of ours (I’m a US Navy vet, Susan Stoker was an Army wife for over a decade and Chris Keniston is a super patriot who believes in helping our wounded vets). This was a mission of heart and supporting our brave vets. Jason’s father was a Vietnam vet, too, by the way. So, we find this a wonderful symphony of synchronicity with an HEA–happily ever after–for our charity. For .99 cents, your subscribers can download a copy and know that the money is going to http://www.vetdog.org. I can’t think of a nicer, more wonderful celebration for everyone involved. 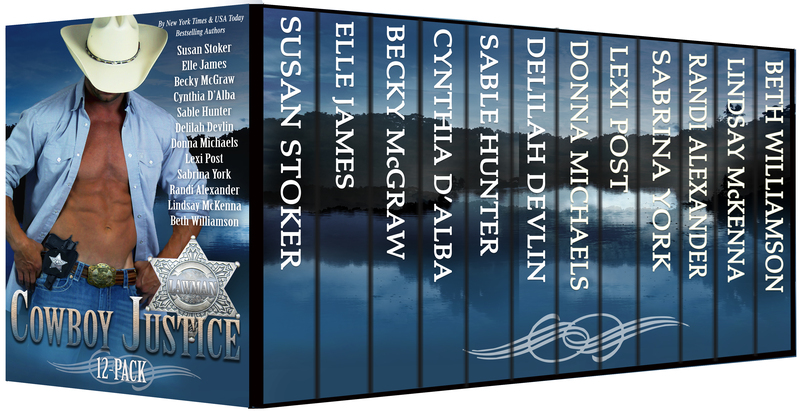 By purchasing the .99 cent anthology, SAVED BY A SEAL, you are helping us to get a service dog for a military vet. Be part of this circling of giving from our hearts. Please SHARE this with friends and family! Thank you. 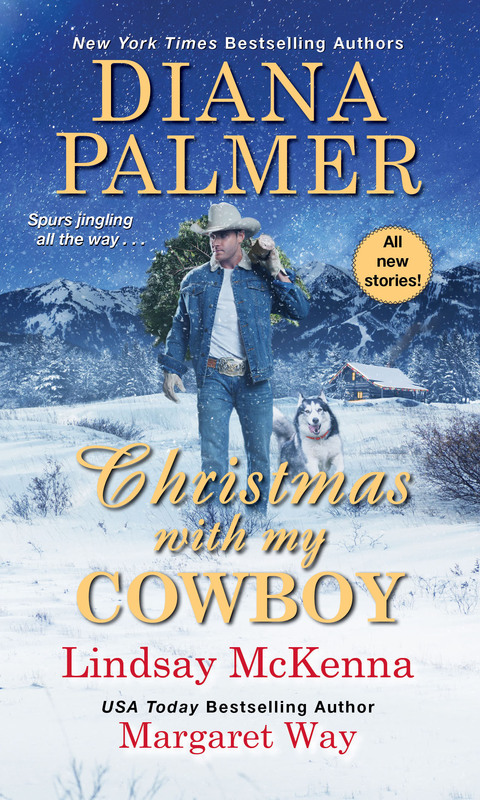 IF YOU COULD CHANGE A WOUNDED MILITARY VET’S LIFE FOR .99 CENTS? WOULD YOU? This is a non-profit charity that trains service dogs for our military vets. 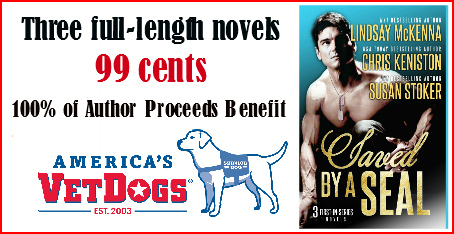 Your 99 cents can help us purchase a service dog for a vet. We need your help and support. Those of you who love to support our military vets who have sacrificed so much for all of us, can use your help. 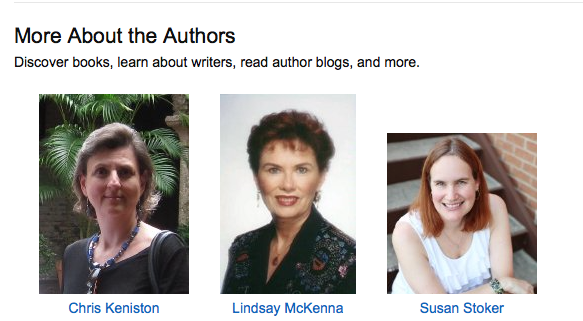 Just 99 cents and you not only are adding to the amount to buy a service dog for a vet, but you also get three great ebooks by three wonderful story tellers: Lindsay McKenna, Chris Keniston and Susan Stoker. Nowadays? .99 cents doesn’t seem to go very far. But you know what? It can help buy a service dog for a man or woman who desperately needs that wonderful animal in their life to help them make their life a little easier. PLEASE SHARE this and ask your friends and family to donate .99 cents to an important cause: caring for our military vets. 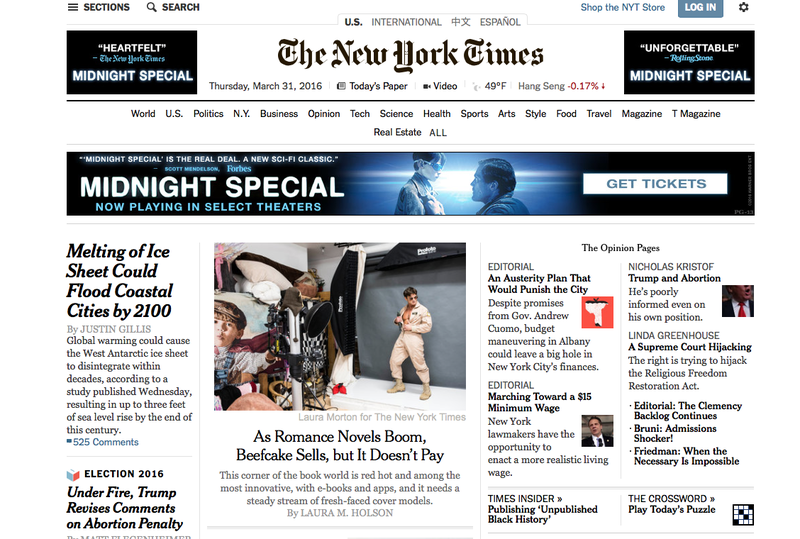 Green button on front page….click and join! You are currently browsing the archives for the Anthology category.